"You don't appreciate how good you have it till it's gone." Or so the saying goes. This "vacation" weekend couldn't have embodied it anymore. Luckily, I have also been reminded just how much God still provides. This week is our annual family trip to Glen Arbor, Michigan. I've spent a week here every year of my life, only missing one or two years for school trips. This time was plagued with lots of obstacles and set backs. First we hit two Thunderstorm Warnings (dark red radar clouds) on our drive north. The second storm turned out to have dropped a tornado on Glen Arbor - which we drove through the tail end of it (dark green) and witnessed its destruction yet uncleared on the roads. It took us two turn arounds due to fallen trees across the road to get to our destination. 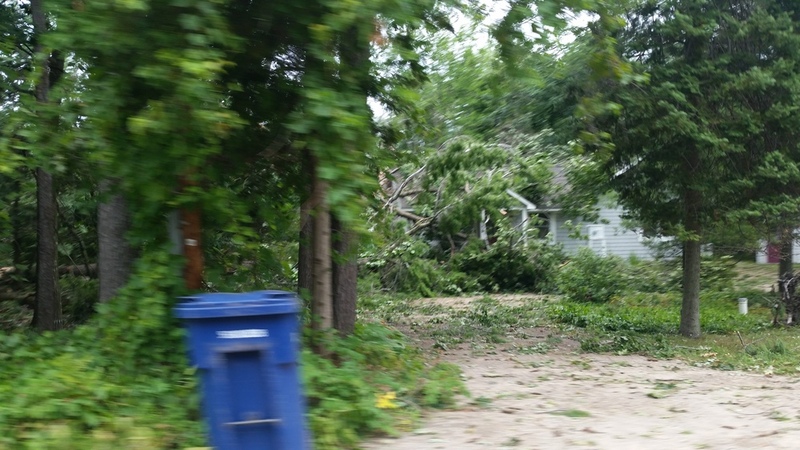 Turns out there is no power for our first night (to be expected with all the downed trees + power lines). But Thank God my father, brother and his girlfriend were completely unharmed after weathering the tornado and its 98mph winds! The next morning (Monday) we learned we had no water (pressure). Now the despair of our situation was starting to set in. We have the condo for the whole week but we learned through word of mouth that the electricity isn't expected to be restored until Wednesday night or Thursday at the earliest. Luckily, morning light always brings optimism and it prompted Hubby + I (with our daughter in tow) to go out and explore the roads for cleared debris, coffee, gas and power. As an excuse to continue driving + charging our phones, we found our necessities in the next town. After a quiet, though slightly stressful day (EJ didn't want to nap after such lack of normalcy), we finally had a real meal out and came back to water pressure! Praise the Lord! EJ was the first in a warm(!) bath, pajamas and settled in her bedtime routine with exhaustion. What a beautiful relief to enjoy a hot shower and fresh clothes! Tonight I blogged with (cold) coffee "the old fashioned way" with paper + pen (my favorite way) + a plate of tea candles. I can only pray God continues His blessings tomorrow morning. 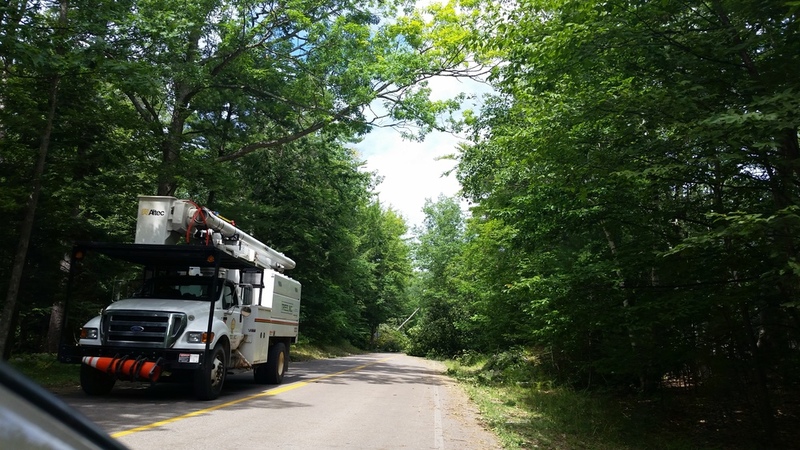 We stopped in Glen Arbor, with some of the roads finally cleared for traffic to get in and out, and discovered there wasn't nearly as much damage as there could have been to properties. Mostly down trees on lawns. I only saw two buildings with damage and never heard of any fatalities or injuries. How amazing! And to top it off, commerce was booming on our way out! Happy to see Glen Arbor bounce back so quickly. Until next time, Northern Michigan. Have you ever experienced extreme weather or the aftermath of it? What were your impressions? I'd love to hear all about it in the comments below! Be sure to click "subscribe via email" to receive comment reply notifications.